Finding perfectly cooked al dente pasta or tiramisu is hardly a trial in a city that has long had a love affair with Italian cuisine. Michelin-starred chef Enrico Bartolini’s newly opened Spiga, however, has a secret ingredient: a charming cinematic experience of retro 1950s Italy with a chic outdoor garden terrace created by local architect Joyce Wang. ‘I wanted to celebrate different aspects of Italian life with several areas within the restaurant reflecting their own side of Italy,’ Wang explains. Textures and colours of the country are presented through a seamless blend of the designer’s own custom-design furnishings and a covetable collection of modern Italian design including modernist pendants and table lamps by the likes of Stilux and Stilnovo, Tucroma dining chairs by Pace, and Terrazzo stone floors. ‘There is a soul in something that has been reclaimed,’ Wang continues. 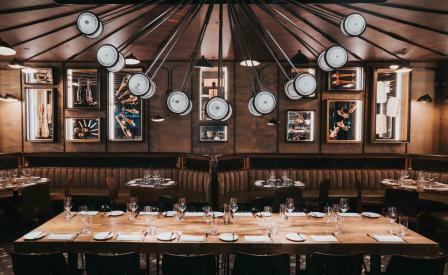 Seating is mainly arranged around cosy clusters and banquettes, but the best spot for people watching is from a central large communal table featuring a dramatic ceiling light complete with working pendulum. Here, a ceiling clad in silk wallpaper and rope alongside walls lined with vintage stall games offers a subtle, playful nod to traditional Italian circuses. It’s the perfect backdrop for Bartolini’s signature Sicilian red prawns with tamarind sauce followed by sublime chocolate foam with hazelnut ice cream.